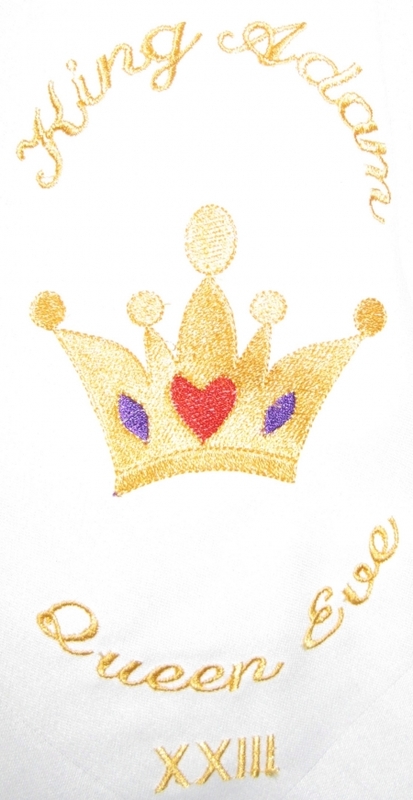 Friday the 13th is whenthe Krewe of Eve (women’s parade) rolls in Mandeville. This is my first time riding and I’m so excited. I have so much to learn, but Yoda Debbi (she invited me in) is teaching me the ropes. The best tricks she taught me is how to save money. Since I was invited to ride, I started putting beads together and collecting stuffed animals! First I want to share a picture of the Queen of Eve from the dinner dance Friday night. Kim was on my float before she became Queen. She looked stunning Saturday night and I bet that outfit was HEAVY! She gave everyone on the float these hand-embroidered second line scarves and we waved them all when she went by! Since I found out I was riding, I grouped all the beads I caught last year by size and in dozens with paper to keep from getting tangled. I came up with 9 bags of 10 dozen in each and hubby bought 10 bags (see I am frugal). 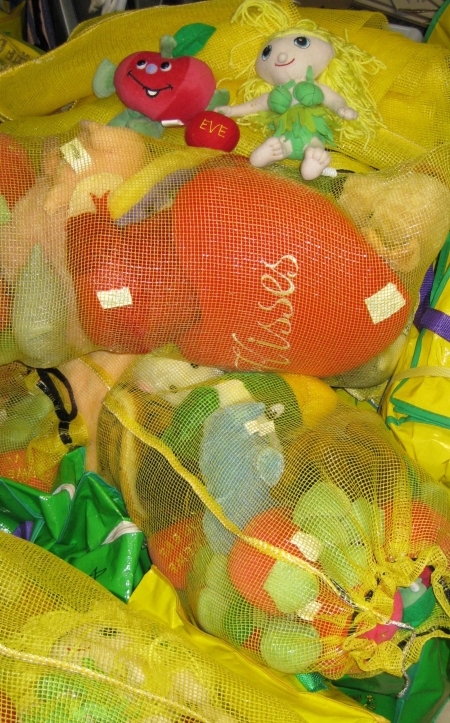 Plush throws are very crucial to the success of a parade. My friend and I have about 7 crawfish sacks filled and we will be blowing up some beach balls to keep with our float theme. You’ll see the little Eve doll in the picture and the apple throws -those are prized catches. 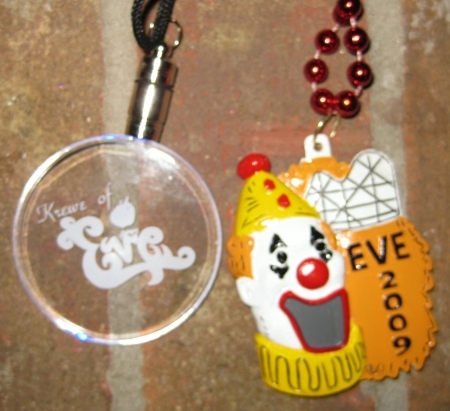 Below are the specialty float bead (I hate clowns) and light up Eve bead. 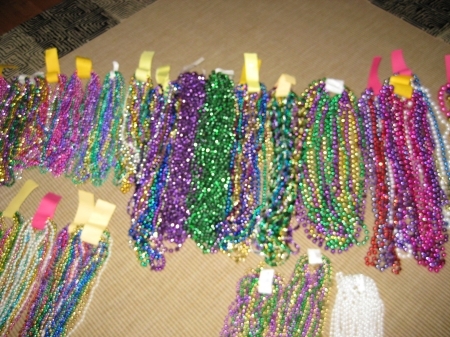 There are also beads with apples that are prized. I’ve got my mask, hat, costume, gloves with cut-off fingers, fanny pack, bungee cords, clothes pins and throws ready to go. I can’t wait until Friday – this week is going to fly. Breakfast 7:30 with the Queen & King, load the float, afternoon party and then 6:00 on the float ready to go! Then Saturday I have my radio show at 9 AM and hubby’s ball Saturday night! OMG – this is insanity! what float number and which side are you on? Looking forward to it! But could you do something about the forecast?? If the parade doesn’t roll on 2/13, we’ll have left town by the rain date. Too bad for us tourists, lucky locals. Brenda – last year the Eve Krewe loaded and then unloaded in the rain and then had to do it all over again on an alternate date. Pray for good weather!!! !